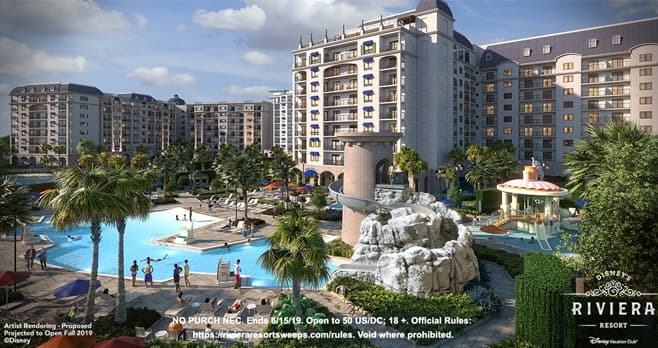 Disney Riviera Resort Sweepstakes (RivieraResortSweeps.com): Here is your chance to win a family vacation to the newest Disney Vacation Club Resort – Disney’s Riviera Resort. Visit RivieraResortSweeps.com and enter by June 15, 2019 for your chance to win. The Disney Riviera Resort Sweepstakes is open only to individuals who are legal residents of, and physically located within the 50 United States and the District of Columbia, who are at least 18 years of age, or the age of majority in his/her jurisdiction of residence, whichever is older, as of date of entry. The Sweepstakes begins on 12:00:00 PM (noon) ET on April 9, 2019 and ends at 11:59:59 PM ET on June 15, 2019. There is a limit of one (1) Website Entry per Entrant, plus up to (4) bonus Entries during the entire Sweepstakes Period. The grand prize consists of a five (5) day/four (4) night Walt Disney World Resort vacation package for Winner and up to seven (7) guests. The Walt Disney World Resort vacation package. Visit rivieraresortsweeps.com to enter and see Official Rules for details.